After collections inspired by Holland, Switzerland and Germany, popular nail polish brand, O.P.I will release a brand new collection inspired by San Francisco this Fall/Winter. 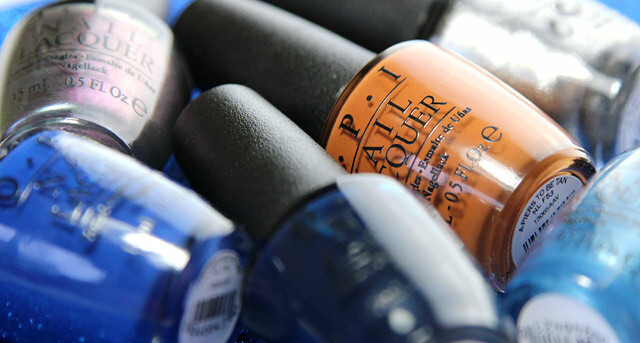 This collection consists of twelve stunning new original polishes, and three new Liquid Sands™. Join me on this journey where I know nothing of San Fran, and get more and more confused as these polish names pass by..
A gorgeous Ruby, Blue-Red creme polish. One of those reds that are Red, without taking over. 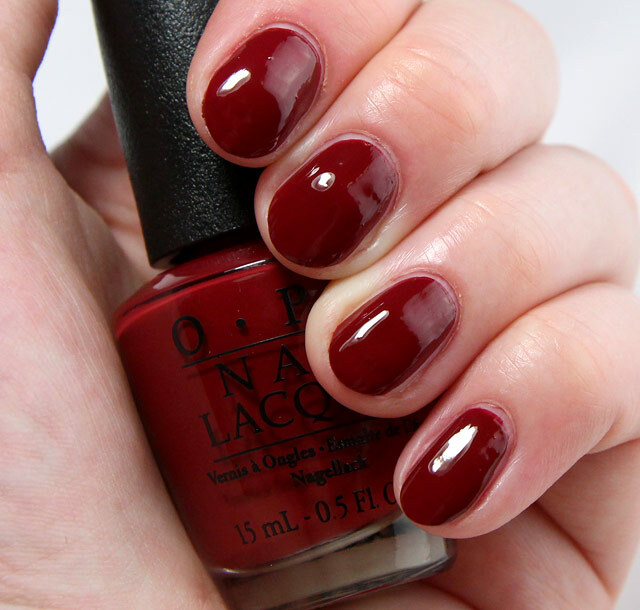 I’d call this the perfect beginner Red, as it’s not too bright and not too dark, perfect to get your love for Red started. I only needed two coats for my swatch. A, what I would like to call, deeper take on “First Date at the Golden Gate”. It’s another gorgeous Blue-Red creme polish, but darker. 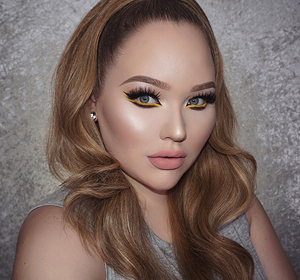 Perfect for a simple statement for Fall. I used two coats. One of my favorites of this collection. 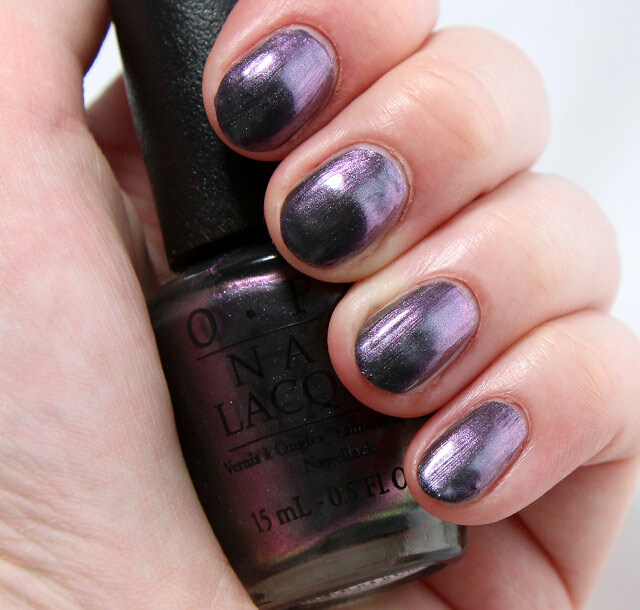 “Embarca-Dare Ya!” is a stunning muted Magenta infused with Silver and Bronzy, Golden micro shimmer. 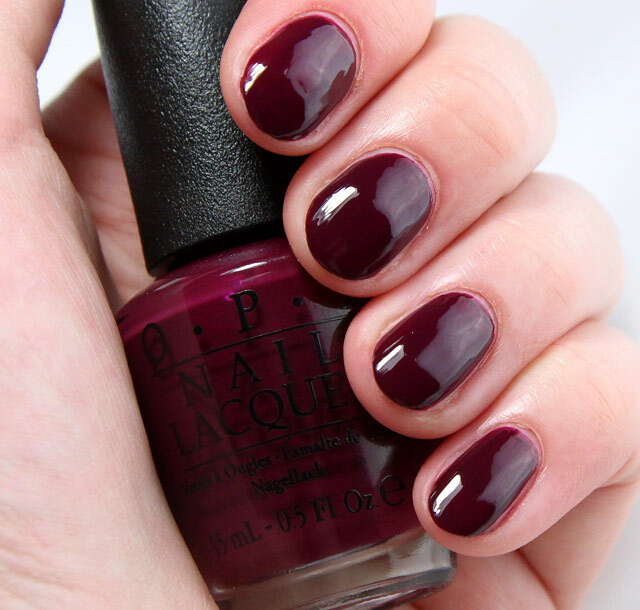 This polish will be an absolute joy for Fall as it is a Magenta, but toned down to the max, making it perfect for those darker days. I only needed two coats. Another favorite + my Mom’s absolute favorite this collection, haha. 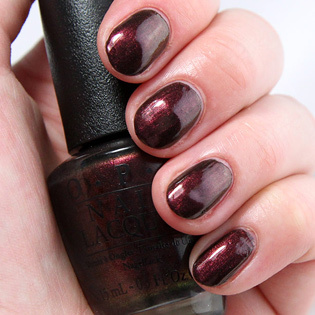 This polish is a truly gorgeous warm Brown base infused with a Pink and Copper micro shimmer. It’s sultry, dazzling and hot. I, again, used two coats for my swatch. 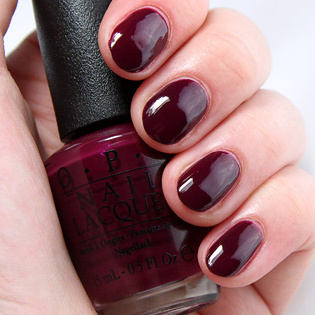 One of those typical Eggplant, Purple creme colors, that get released with every Fall/Winter collection. Don’t get me wrong “In the Cable Car-Pool Lane” is beautiful for fall as it is edgy and dark, but not really that new and exciting, is it? This was a two coater. Oeh, another pretty one! 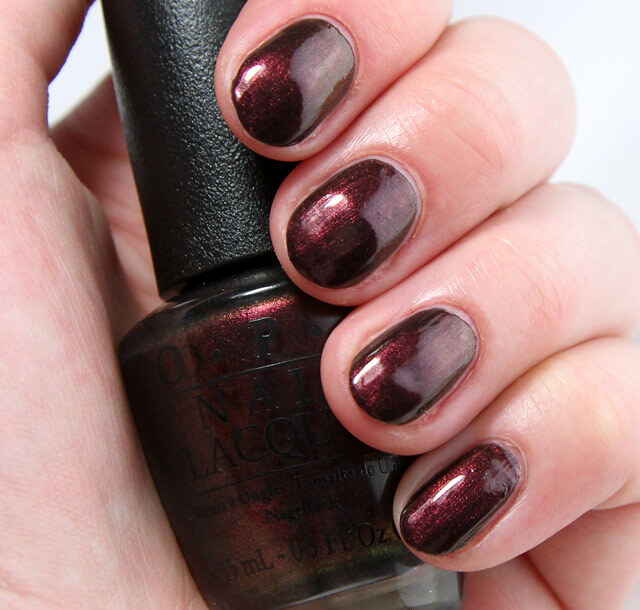 With an almost black base and Bordeaux/Moss Green duochrome “Muir Muir on the Wall” is one of the best polishes this collection. It’s sultry, but still gives you that unique pop with its Bordeaux/Moss Green duochrome. I had to use two coats on some nails, three on others. 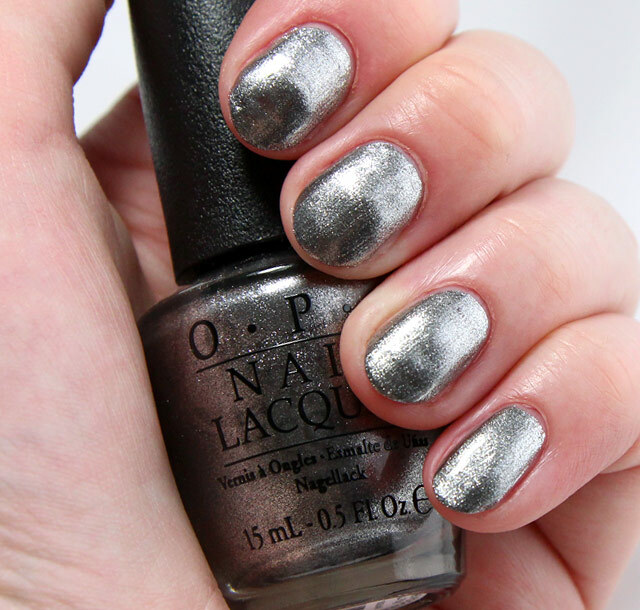 The first thing that came to mind with this polish: A sparkling, foggy, Silver cloud. “Haven’t the Foggiest” is a darker Grey base with light Grey and Silver micro shimmer that just floats all over. It’s glowy, it’s fun! I used two coats on some nails, three on others. Finally, I was waiting for a good duochrome! This is a dark Slate Grey base with a Violet/Pink shine one time, Chartreuse/Hunter Green the other. Oh, and that all infused with some Silver micro shimmer. Did that make any sense? I needed three coats, for perfect application. Oh, Yes, this San Francisco collection now finally has a pop of color too. 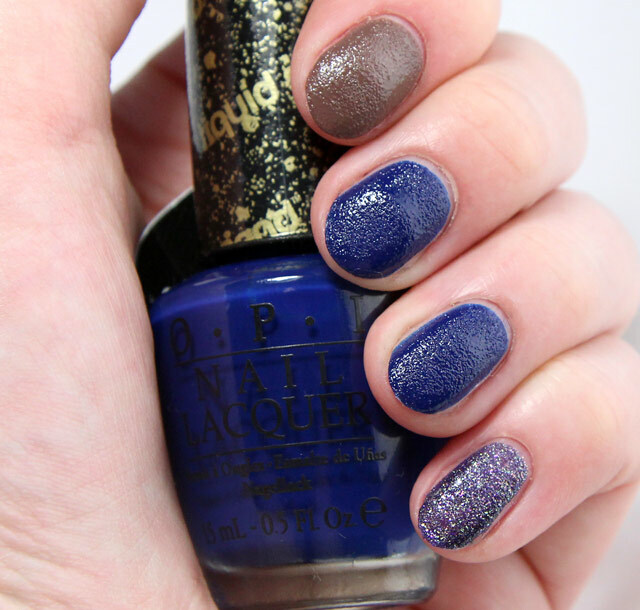 A denim-Blue base with Silver and bright Baby Blue micro shimmer pop of color, that is. This definitely is a favorite as it is so fresh compared to all the other colors. I used two easy coats for this. 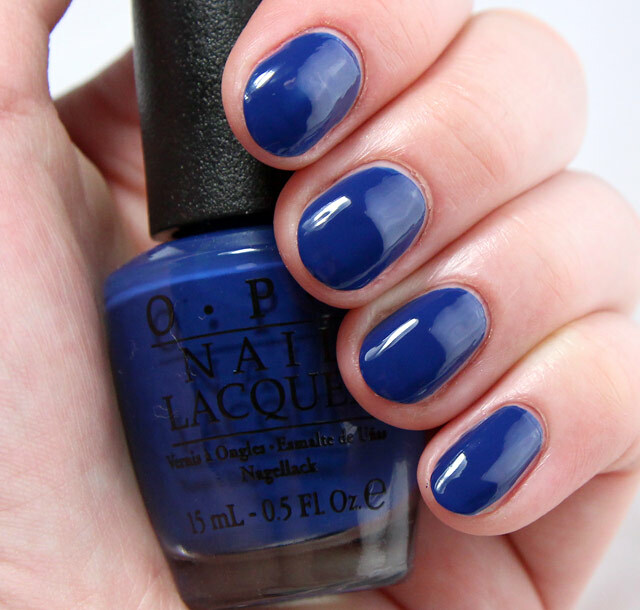 Easily described as a true, royal Blue creme polish. It reminds me a lot of Ciaté’s “Power Dressing” which I’m a huge fan of. “Keeping Suzi at Bay” is a beautiful statement color, and it only needed two coats to cover my nails in full opaqueness. 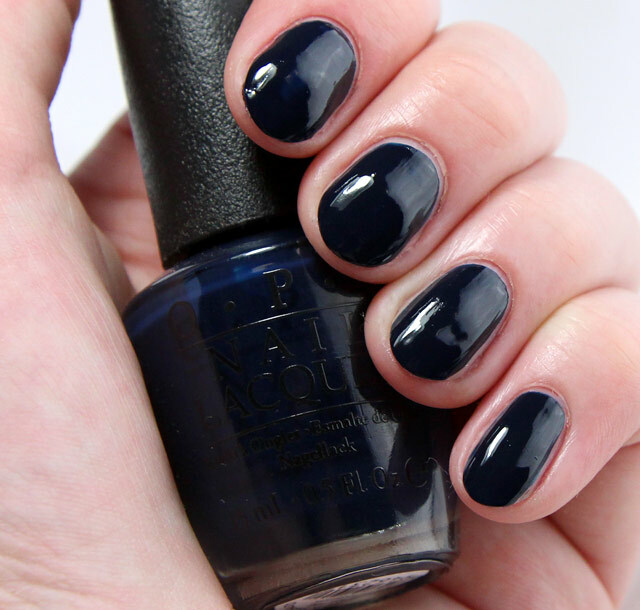 A dark, dark, almost Black, Blue polish. 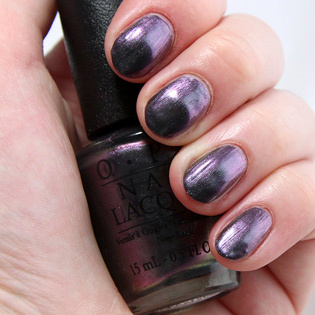 How I wish they would’ve made this an awesome Dark Blue, Purple duochrome or something. Right now it’s a little too plain for me. But hey, to each his/her own, right? – Two coats were applied for this. 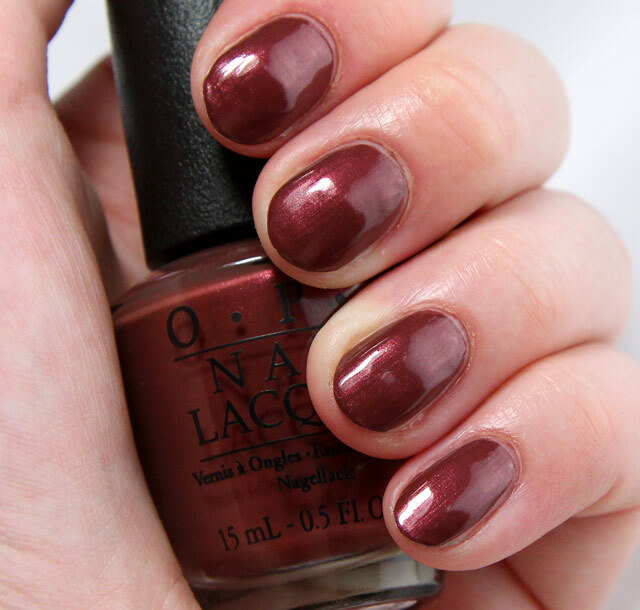 Definitely a Caramel-y, Chocolate inspired color… My, oh my, do I hate this one me. It downright reminds me of a caramelized, chocolate monster that pooped on my nails. I did only have to use two coats though, that’s good. Three new limited edition Liquid Sands™. And I’m loving this gritty trend. It’s been going strong for a couple now, but you won’t hear me complaining any time soon. Best out of the three definitely is “Alcatraz… Rocks”. Liquid Sand finish? I like you. Liquid Sand Finish with Glitter? I NEED YOU IN MY LIFE. 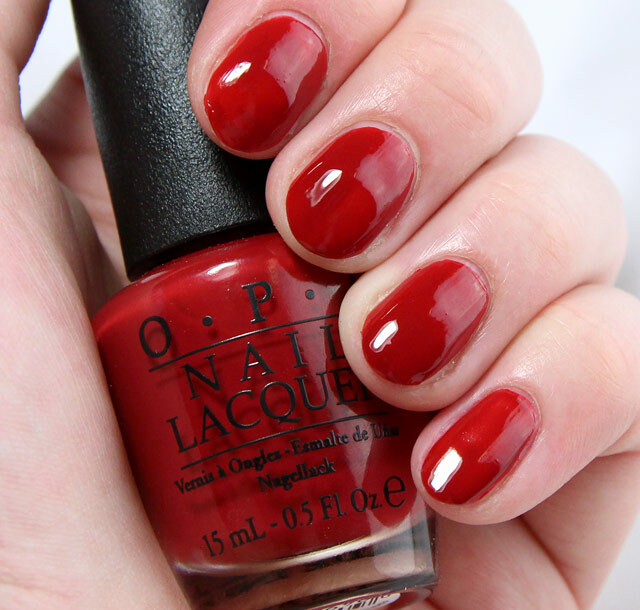 As always O.P.I will also sell a Mini Pack (€18,95) including:“First Date at the Golden Gate”, “Muir Muir on the Wall”, “Peace & Love & OPI”, “In the Cable Car-Pool Lane”. This is a fun collection, but overall I’m not that massively blown away by it. 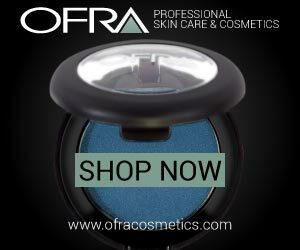 “San Francisco” has some exciting micro shimmer and duochrome winners, but also some very plain, not very “new” creme colors. The formula is great since, non of these were horrors to work with. Also, the main lot of this collection was a two coater, yay! 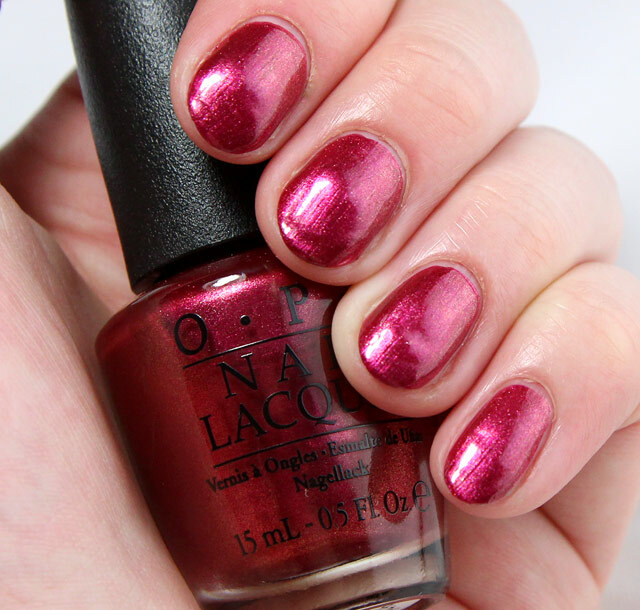 Overall: “San Francisco” is fun and has some good quality polishes, but I’m not god-smacked amazed by it. O.P.I’s “San Francisco” Fall/Winter collection will launch Late August 2013. Although the colours may not be super exciting, I DO love these colours! I definitely will put some money away to buy one or two of these. I especially love “I Knead Sour-Dough”, such a beautiful and pretty unique colour! Ik vind niet alle kleuren even leuk maar ‘In the Cable Car-Pool Lane’ vind ik supermooi! Ik zie er nog niet een kleurtje tussen die ik graag zou willen hebben. Some really pretty colours, favourite was Muir Muir On The Wall. I also LOVE the Liquid Sands and they come if surprisingly well. I just wish they’d say no to brown poo-y coloured polishes, nobody wants to look like they’ve just dipped a their nails in a turd. Er zitten zeker mooie kleuren tussen! Leuke collectie alleen beetje donker voor deze tijd van het jaar.. I live in the Bay Area/San Francisco, so each color suit perfect with each name (most of these names come from activity/tourist spots or locations in San Francisco.) I definitely need to get ahold of this set. “Muir Muir on the Wall” “Incognito in Sausalito” vind ik het mooist. “A-Piers to be Tan” zou denk ik wel mooi staan bij een donkere huidskleur.